I’m apologising to Gregory Porter, trying to convince him that it’s not my usual form to ask musicians about what they are wearing. But Porter is different. Search all you like, you will not find a single photograph of the acclaimed American jazz vocalist where he’s not beaming a big, friendly smile out from beneath his trademark hat, an improbable Sherlock Holmes-style affair with flaps that cover his neck and ears. So I have to ask about the hat. “It’s all right,” he says gently. “Everybody does. But you’ll get nothing out of me,” he adds, laughing. If gentle is the right word for the soft-spoken singer, the other word that springs to mind is “giant”. The 44-year-old from Bakersfield, California, is a big man, with a big voice and a big heart, and, since the release of his Grammy-winning Liquid Spirit album in 2014, a big international star. Born the seventh of eight children to a single mother, there wasn’t a lot of money around when he was growing up, and becoming a musician wasn’t on his horizon. His mother, Ruth, was a minister at the local church, and if he doesn’t want to talk about the hat, he is more than happy to talk about his biggest influence. “She was an extraordinary woman. She had just loads and loads of energy. She worked two jobs, but, you know, I don’t really remember her being away from home a lot. Ruth Porter died of breast cancer in 1991, long before her son rose to international fam. Did he fully appreciate her at the time? The other treasure Porter inherited from his mother was music. As well as plenty of southern gospel and church music, his mother’s record collection was where he was first exposed to jazz, particularly Nat King Cole, and to this day that’s the name that trips first off her son’s tongue when you ask him about his influences. Add Marvin Gaye, Donny Hathaway and a little bit of Stevie Wonder, and you have a good summation of Porter’s unique sound. It was sport and not music that consumed his early energies. An athletic scholarship bought him a place at San Diego State University, and he looked set for a career as an American football player until a shoulder injury in his junior year abruptly ended his sporting ambitions. It would be another 20 years before the music world sat up and noticed Porter’s astonishing voice. He moved to New York, working in kitchens and factories, and sitting in on jazz sessions in Brooklyn clubs at night, gradually honing his jazz chops. 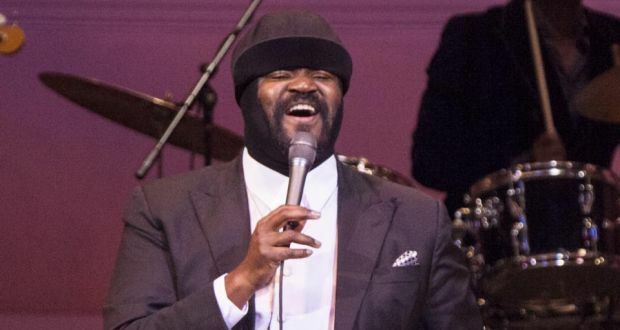 Along the way, there were near-misses – appearances in Broadway musicals, a cameo on jazz flautist Hubert Laws’s tribute to Nat King Cole – but it wasn’t until 2010 and the release of his debut album, Water, at the age of 40, that the name Gregory Porter began to be whispered in jazz circles. It’s unusual for jazz singers to write their own songs, but Porter’s unique way with words, at once earthy and idealistic, makes him something particularly rare in jazz. His song 1960 What?, about the 1967 Detroit riots and the death of Martin Luther King, is a searing rant with contemporary political resonance that Marvin Gaye could have written. But the same pen can also write a tender song such as Real Good Hands (from his second album, Be Good) about a young man asking his intended father-in-law for permission to marry. With the release of Liquid Spirit, the whispers became a roar of acclaim, and Porter joined the tiny group of jazz musicians who have broken through to a mainstream audience without losing credibility. Now his forthcoming album, Take Me to the Alley, to be released at the beginning of May on Blue Note, looks set to bring the cat in the hat to new heights. So seriously, what’s with the hat? “You know,” he says, relenting, “this is funny. Yesterday I read somebody said, ‘He was in the war and that’s why he wears the hat’. Now I don’t know what war they’re talking about. But there’s just a whole bunch of stuff like that out there. Yes, I am covering some scars from some past injuries, but I wasn’t in any war, and nobody shot me in the head. “Now it’s my identifier. I was on a plane recently flying into Lebanon and a group of Lebanese teenagers knew exactly who I was, and it was the hat. Everywhere I go now, it’s my style. I have to wear it, in a way. It’s just my thing”.